These are 3-hour bite-sized courses ideal for new learners. It will give you an overview of the contents to be covered, and if more in-depth learning is desired, you can sign up for the full course. These bite-sized courses are held at selected conveniently located public libraries at a nominal fee of $10 to help start your learning journey. These courses touch on a wide range of life-skills in addition to work-skills. 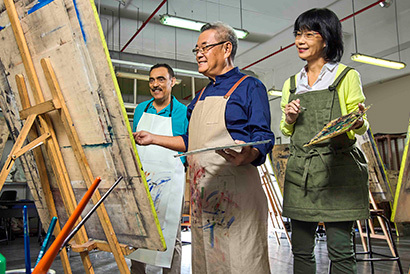 Eligible seniors aged 50 and above will receive subsidies for courses offered by PSEIs as well as the community-based organisations. These modules are drawn from existing full-qualification programmes offered by ITE, polytechnics and the universities for a token fee. Eligible seniors may attend these modules alongside regular students who are taking these modules for credit, i.e. to earn a certificate like a degree or diploma, but while the regular students need to sit for the exams, seniors do not need to. These are programmes such as the Intergenerational Learning Programme which pairs students with seniors to learn about selected topics. Other programmes include short talks offered by community-based organisations targeted at seniors. Comprising a network of course providers, the National Silver Academy (NSA) offers a wealth of learning opportunities that were never before so widely available to the public. Click any button above to begin your exciting journey now at National Silver Academy!